Snout Magic 2X: Get More Less Organic Premium Dog Nose Butter Moisturizer Balm Cream to Cure Sooth Dry Chapped Cracked Rough Crusty Snout - 4oz by Snout Magic at Annie's Dog Spa. Hurry! Limited time offer. Offer valid only while supplies last. Is Your Beloved Dog Suffering From Frustrating Dry & Cracking Nose Problems? ''Get Ready To Say Goodbye To Cracked & Irritated Dog Snouts For Good! Is Your Beloved Dog Suffering From Frustrating Dry & Cracking Nose Problems? "Get Ready To Say Goodbye To Cracked & Irritated Dog Snouts For Good! This Proven Solution Works Like 'Magic' 100% GUARANTEED!" Introducing Snout Magic -100% Organic & All-Natural Nose Butter-The #1 Dog Nose Balm That's Safe For Dogs & Humans And Works Like Magic! "Finally, LASTING Relief For Your Dog's Dry Nose That Works Like Crazy (And Fast!)" There's nothing worse than when your best buddy looks up at you, with his or her loyalty & all you see is a dry & cracked nose caused from Hyperkeratosis. The cracking. The occasional bleeding. You know that it has to be painful for your dog. Of course, dogs are full of so much love that they'd never let you know they are hurting even when they are. "What you need is a PROVEN SOLUTION that will finally cure your own dog's dry nose quickly & safely..."
You need something that is safe for them, safe for you, and has a proven track record of real success! 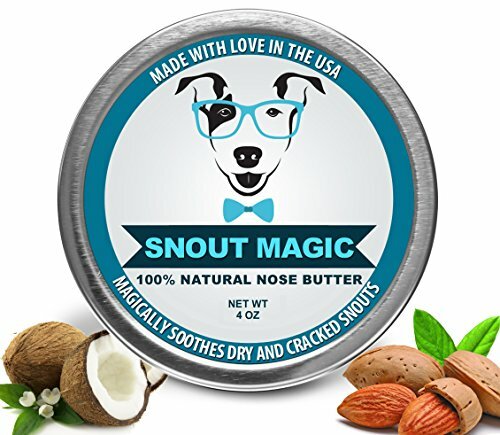 Introducing Snout Magic, the #1 dog nose butter made of only 100% natural and organic coconut oil that will finally give soothing and lasting relief to your dog's worst cracked and dry nose. Snout Magic is the "go to" solution for dog lovers all across the country, and even the world, when they need a real solution to help their dog's dry nose FAST! Snout Magic is the PROVEN SOLUTION that will finally cure your own dog's dry nose quickly & safely... We GUARANTEE IT! "Let Snout Magic Put Its Magical Spell On Your Dog Right Now For Ultimate Nose Healing!" ★Best Selling Premium Dog Nose Butter with Over 792+ Reviews. Just released Jumbo 4oz tin! ★For more Satisfied Customers (Over 532+ Verified Buyers at 4.98 Stars, Check Out Our 2Oz Tin! If you have any questions about this product by Snout Magic, contact us by completing and submitting the form below. If you are looking for a specif part number, please include it with your message.